Rajadhiraja Chola II was one of the Chola kings who ruled during its downfall and one of the several kings who were responsible for the downfall of the great Chola empire. He ruled Chola country which was once ruled by great kings like Karikala Chola, Aditya Chola, Parantaka Chola, Rajaraja Chola I, Rajadhiraja Chola I, Rajendra Chola I etc. 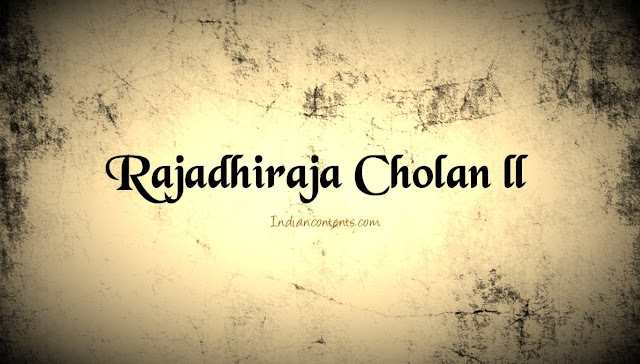 Rajadhiraja Chola II succeeded Rajaraja Chola II around 1166 A.D. He ruled between 1166-1178 A.D. The major issue happened during his time which led to weakening of Chola empire was Pandyan succession dispute in which Chola intervened under Rajadhiraja Chola II. He was not the direct descendant of Rajaraja Chola II as he was the son of Rajaraja Chola II's sister. Rajaraja II chose him as his successor as he did not have son of his own. As we know that the great Kulothunga Chola I of Chola dynasty invaded and captured whole Pandya empire. After that Kulothunga appointed Pandyan princes as Viceroys who work under Chola government. After that Cholas slowly started losing control over Pandyan territory as some of the Pandyan princes started revolting against Cholas. During Rajadhiraja Chola II's reign, they lost control completely over Pandyas. Around 1166 A.D., a dispute of succession arose between Parakrama Pandya of Madurai and Kulasekara. Kulasekara attacked Madurai with a heavy military force. Parakrama Pandya asked help of Parakramabahu I, king of Lanka. Before the help could reach, Kulasekara very brutally killed Parakrama Pandya, his wife and some of his sons. Parakramabahu I decided to kill Kulasekara and install Virapandya (son of parakrama Pandya) as the new king of Pandya empire. A fierce war broke out between Lankan forces and Kulasekara. Kulasekara requested the help of Rajadhiraja Chola II and a large Chola force was sent to his aid. The Chola help was of no use as Kulasekara lost the battle and Lankan king installed Virapandya on the Pandyan throne. Rajadhiraja II felt insulted and he continued to fight Lankan forces. Very soon, the Chola force won the battle and drove back Lankan force to their Island. Now Cholas made Kulasekara as king of Pandyan country. Now the Lankan king wanted to take revenge on Cholas and planned to invade Chola country. The Cholas came to know this and they landed a attack on Sri Lanka. A large Chola force landed on Lankan Island and caused a huge damage there. Parakramabahu I recognised that his support to Parakrama Pandya gave him this result. So he thought that Kulasekara was the able king of Pandya empire and befriended Kulasekara. They both now planned to crush the Chola power and the Cholas didn't expected this alliance. Now the Cholas waged a war against the combined forces of Lanka and Pandyan empires. The fierce Chola army defeated Kulasekara and installed Virapandya to the Chola throne. A number of feudatories of Cholas started revolting and declared themselves independent. This weakened the Chola power gradually. Rajadhiraja II saw many revolts during his reign and took no effective measures to crush them. He was succeeded by Kulothunga Chola III around 1178 A.D.